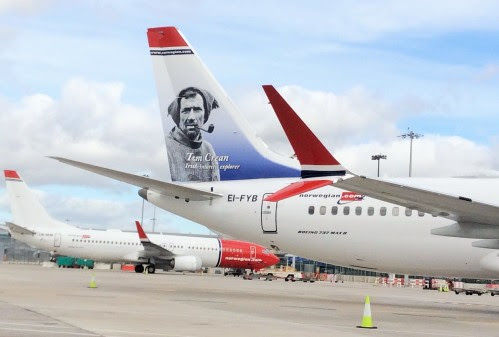 They feel so much part of the aviation landscape that it is a little hard to believe that Norwegian has only been serving the long-haul market from Belfast for a year. But, just a year it has been and to mark this special occasion the World's Best low-cost long-haul airline is offering some amazingly special fares, but be quick they are only on offer for a limited time. Norwegian offers seasonal transatlantic nonstop flights from Belfast to New York Stewart International Airport and Providence Airport, Rhode Island, near Boston on the US east coast. The carrier is using its brand new Boeing 737 MAX aircraft on the routes which are fitted out with 189 slimline seats from Belfast to the USA four times a week in the summer season. The 5-day offer is available on Norwegian’s affordable transatlantic flights from Belfast nonstop to New York Stewart International Airport in New York state and Providence International Airport in Rhode Island which offers good access to Boston and attractions in New England from just £79 one-way*. Customers can book now at www.norwegian.com/uk using campaign code FLYFORLESS. Of course, as you would expect the fares are subject to availability, are limited in number, one-way and certain other terms and conditions apply. Thomas Ramdahl, Chief Commercial Officer at Norwegian said:“A year on from launching our first transatlantic flights from Belfast, we’re giving consumers in Northern Ireland some of the lowest fares ever to the USA from £79. “Our special £79 fares to New York and Providence-Boston will be available for a limited period, so there’s never been a better time to plan a trip to America and enjoy our brand new modern and spacious aircraft with high-quality service along the way.”.